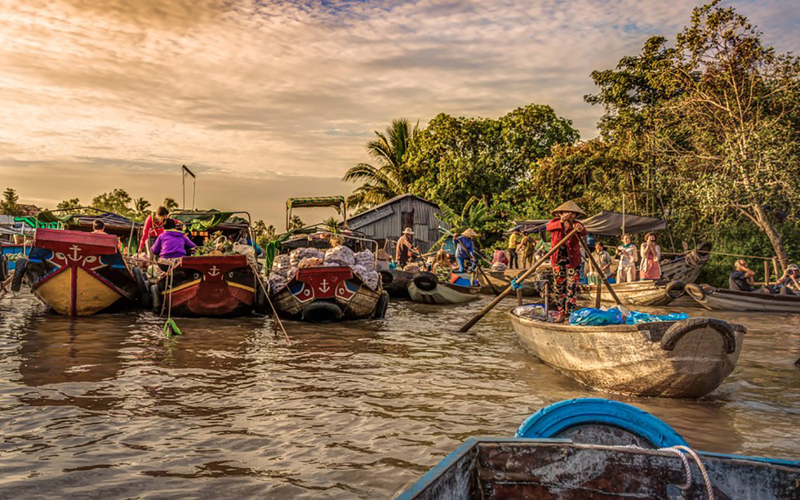 If you are looking for some activities in the afternoon to fill your time or the other thing to do beside the floating market or you are a bike lover…! Let’s go for stunning bicycle ride. Your guide will take you weaving through from the small alley, cycling along the river to the charming villages. We can be able to stop for some interesting sides along the street. It brings you different feeling of Can Tho city. Meeting the guide at the hotel and going by ‘motorbike’ – typical Vietnamese transportation to the fruit garden which is 20 minutes from the city center. Then, starting to have a bicycle ride from there. Travelling by bicycle around the small village to have a closer look about the local living along the way. Visiting either Thien Vien Truc Lam or Ca Cao farm depend on the availability. On the way, having a chance to stop at Gian Gua historial relic (a former military shelter during Vietnam war). Having Vietnamese pancake ‘Bánh xèo’ or ‘Banh Khot’, mini pancake which is typical well-known food in the South at the small family business. Motorbike taxi and bicycle rental. A light course and drink. Pick up at hotel in the city center.